Pipelines—and opposition to them—often make the news, but this time the news hits very close to home. Energy company TransCanada is proposing to build a pipeline that would carry 1.1 million barrels of crude oil per day from Alberta and Saskatchewan to ports and refineries in New Brunswick. 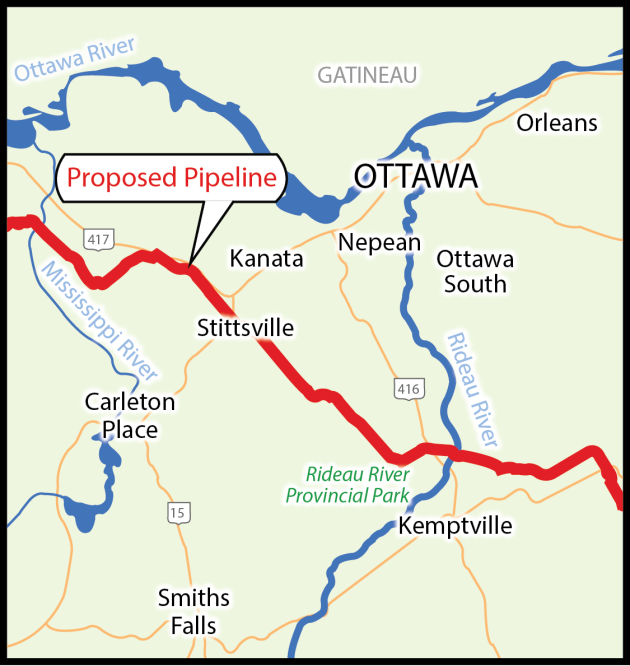 The Energy East pipeline would link newly constructed pipeline with sections of converted natural gas pipeline, including a section running through Ottawa. What does this mean for people living in and around Ottawa? According to several local groups and many residents, the proposed pipeline offers few benefits and far too many risks. One group, Ecology Ottawa, is using its Tar Free 613 campaign to raise awareness about the pipeline and its implications for our health and environment. First, there’s the risk of spills. In October, CBC News reported that National Energy Board data reveal over 1000 safety-related incidents—including explosions, spills and worker deaths—along federally-regulated pipelines between 2000 and 2011. Ecology Ottawa adds that pipelines in Canada are aging, and that shipping corrosive tar sands oil requires additional chemicals that would also be released during spills. In Ottawa, the pipeline would travel through residential areas, farmland, conservation areas and the Rideau and Mississippi River systems, all significant from an ecosystem, food supply and health perspective. A further concern is that the pipeline would facilitate the expansion of the tar sands, which are already creating problems for Indigenous people, communities and the environment and climate. Ecology Ottawa is encouraging people to contact their city, provincial and federal politicians about the Energy East pipeline, and they’ve also posted a petition at http://ecologyottawa.nationbuilder.com/tar_sands_oil. They also welcome volunteers to get involved and help spread the word. 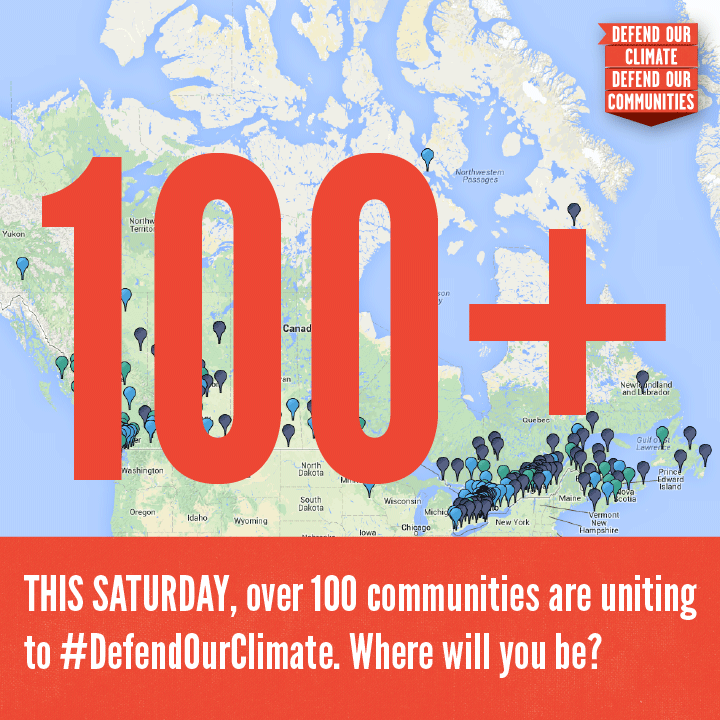 Also in Ottawa, people will be joining thousands of others across Canada on November 16, 2013 for Defend Our Climate, Defend Our Communities, a national day of action organized by a coalition of dozens of groups to show their opposition to pipelines, tar sands expansion and climate change. Everyone is welcome to meet at the Eternal Flame on Parliament Hill at 1 p.m. You can RSVP online. There are indications that community action and speaking out do make a difference. In October, TransCanada said that it’s delaying submission of the Energy East proposal to the National Energy Board. Just this week, the Ontario government announced that the Ontario Energy Board will undertake public consultations and assess the proposed Energy East pipeline in terms of safety, environmental, energy and economic considerations. Join the fight! No Dirty Oil in Our Backyard!